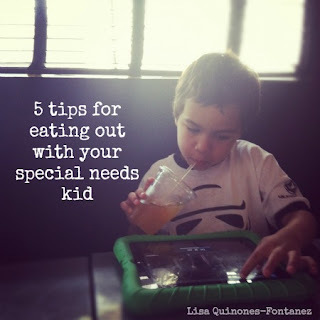 Julia Child once said, “Dining with one’s friends and beloved family is certainly one of life’s primal and most innocent delights, one that is both soul-satisfying and eternal.” Julia may be right but dining out with a special needs kid may not be so delightful. The years before and after my son, Norrin, was diagnosed with autism, dining out was practically impossible. I couldn’t understand how some families could make it look so easy, when we were having such a difficult time. Once I started to understand the diagnosis and after working with different therapists, I learned that things that come so easily for others, are challenging for children with autism. There were several socialization scenarios Norrin needed to be taught – including dining out in public. I realized that I didn’t want to keep Norrin from having that social experience.